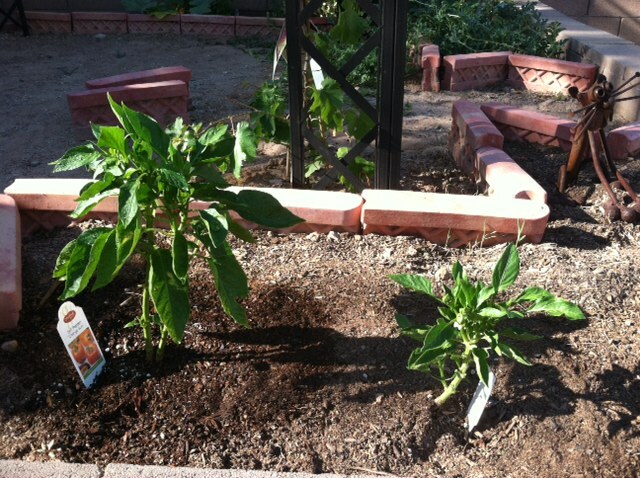 For the first time ever, this summer we attempted to grow vegetables in the corner garden around the pergola. It was a blast this year! I guess I’ve been prejudiced against growing veggies all of this time. Though I do like to eat my veggies, for years I wondered what was the point to growing your own. You can buy them from a supermarket that you like and then you don’t have to go through the difficulties of tending them. Flowers are showier so when someone mentioned gardening to me in the past, it was this kind of gardening my mind would imagine. However, after this summer experience, I can honestly say that veggie gardening is much more fun and entertaining than flower gardening. I like both, but I think the former is more exciting where the latter is more subtle. One good reason to grow your own veggies is that it can be important for kids to see where food comes from; that it is hard work and that it is amazing to see life develop where there was just dirt before. Plus, you get to eat what you worked on! In addition, like many kids, I figured that they would be more likely to eat more vegetables after they were excited by the entire growing process. This ended up proving true. Another good reason is that as an adult, I found myself just as excited to see the veggies grow and enjoyed eating what we grew with relish. Yes, veggies do taste better fresh from the garden and whatever helps us eat healthier is worth the effort (and fun)! I watered them every morning with a hose on the soak setting for about 2-3 minutes for each plant. In the beginning it was wonderful to see everything growing up under the sun. If I was late watering, the pepper plants and the squash would look pitiful but I felt so good when they would perk up with the water. We thought the yellow peas would never sprout because it took them a few weeks. 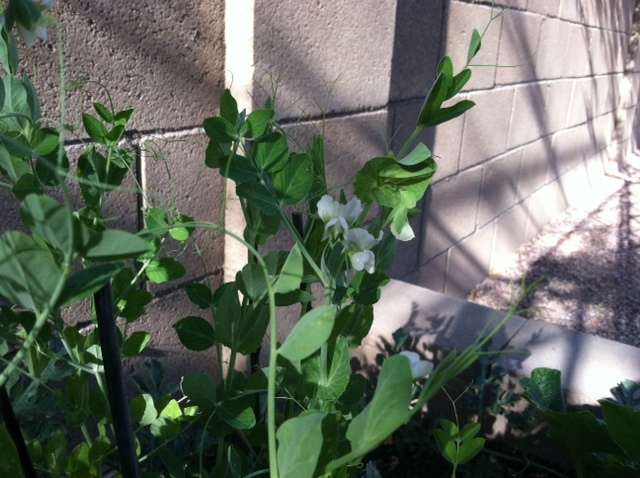 But when they did poke up, we all cheered to see the little baby pea plants coming up. Then they started growing tall! I had to put in thin bamboo poles for them to climb. Their flowers were a sweet pink. Lovely. The stevia sprung up as well and got a good foot tall before too long and I also had to give it some bamboo pole support. The strawberry plant produced strawberries right off the bat. My 2 year old daughter ate them as soon as she saw one turning red. I had to start picking them early if anyone else wanted to have one. 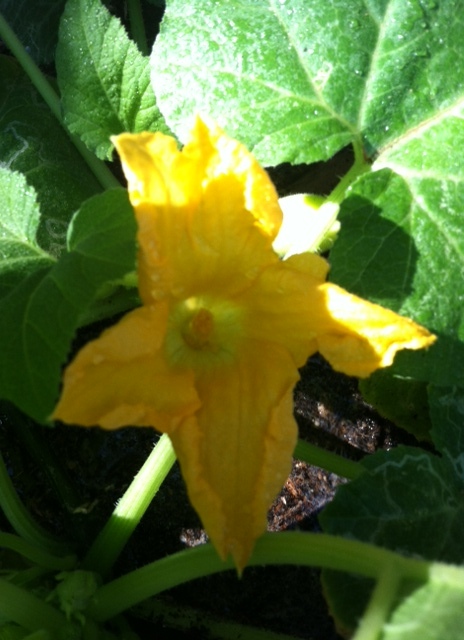 Soon the squash, watermelon and cucumber were flowering. Amazing to see every morning! So cheerful! The grape vine was speeding up the pergola. So cool to see it climb. The squash soon produced little squashes about 3 inches. I ate one but it was too early I guess because it tasted chalky. I left the rest to get bigger. I did the same to the first cucumber. A watermelon grew in about a month and about 5 inches in diameter. We harvested it and it was nice and sweet. The queens wreath was not doing much and the pepper plants seemed out of sorts. I gave the peppers more water and they got better. But it took them a long time to flower. The queens wreath was just hanging out for the beginning of summer though. Then I went to Wisconsin for 2 weeks to visit my parents with the kiddos and left Jeremy to water the plants. Well, when I got back the yellow peas and the squash were toast. So sad! Jeremy’s watering habits were different and the summer sun in Tucson of course was unforgiving. 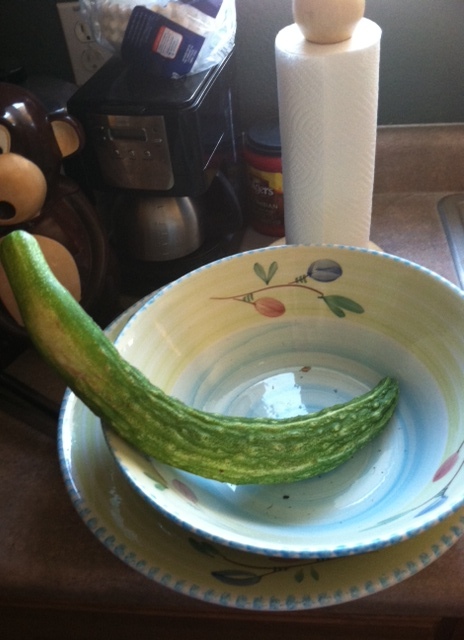 I was able to save the cucumber and we got 4 HUGE cucumbers from the plant. The watermelon made 2 more watermelons but they needed longer to grow than the first and I harvested them too early. The strawberry plant stopped producing. The grape vine stayed the same height as when I left. But the peppers were just getting going! Even though the peppers plants stayed small and grew small peppers, they produced 2 or 3 a week towards the end of summer. My son loved eating the peppers the most of all. The First Pepper to Grow – Adorable! 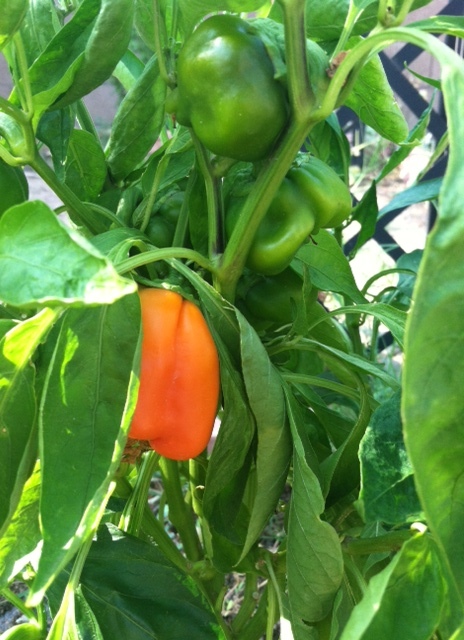 One of the Peppers Turning Orange – Beautiful! 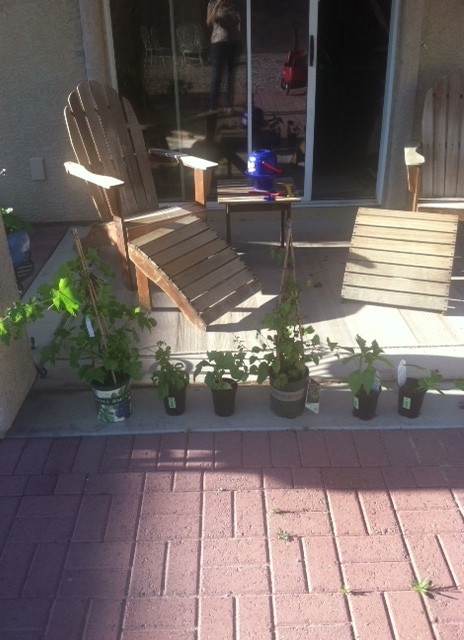 The stevia was also thriving in the heat and kept growing. Towards the end of August it started to flower. It was about 4 feet tall by then. The queen’s wreath went crazy and climbed all the way up the pergola and grew lovely sweet pink flowers. Very pretty! So then harvest time, September and October, which is about now. Well, the cucumber and watermelon passed away in early September. The leaves just stopped soaking up the water and they died. The strawberry plant is still hanging out as is the grape vine. The peppers are still producing though a little slower. The queen’s wreath is also slowing down and the little link flowers are drying up. I harvested the entire stevia plant last week. 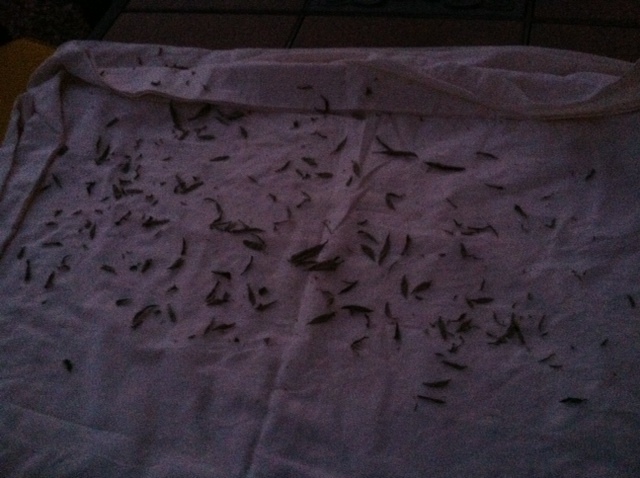 I picked off the nice green leaves and dried them on a sheet in the sun in batches for 3 consecutive days. I would have done it all at once but my mornings do not allow for 2 hours of leaf picking as required with a 2 year old running around and potty training. Harvesting the Stevia – Evening Photo, Time to Take in the Dried Leaves! The mum, which I haven’t written much about, is of interest right now. It was a leafy green shrub which was in a sorry state when I planted it from its tiny pot, but got gradually larger over the summer. Now it is plumping up now that the weather is cooler. It has hundreds of buds waiting to burst. Can’t wait to see the flowers. I forgot what color they are, it has been so long. I feel that we did become personally involved with this garden and it was a good experience. It was a lot of work and I think that I will wait until next summer to have a garden this large again. In Tucson, I COULD start all over with a winter garden. But I need a little break from the excitement. Also, an irrigation system would help motivate me to grow more throughout the year. But we will work on that in 2014. Until next year, I think this is the end of the gardening posts while I go inside and start my bake-o-palooza for the holidays. Wonderful experience for the family. Makes me want to start a compost this winter so it will be ready for spring gardening. Send pictures if your garden! I would love to see it!